Eric is sick with a cold, so while he is at home perfecting 'Black Magic Woman' on guitar hero, I'm trying my best to keep up with post-holiday orders and flower deliveries. 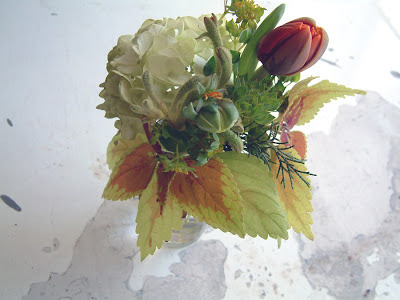 This morning I went to the flower market to pick up a few things. On the 1 Train home I had the pleasure of sitting next to a gentleman who made it his business to call out the station stops. THIS IS FOURTEENTH STREET! MANY TRANSFERS AVAILABLE! This made my day..
And WHEEEEEEEEEEE!!!!!!!!!!!!! FASHION!!!!!!! ... tonight I will sleep tight knowing this little baby is mine. I've been eyeing this clutch for some time, and today it was 40% off at Dear Fieldbinder. Whoever says happiness is not wanting anything has not dropped cash on a Joanna Louca bag. 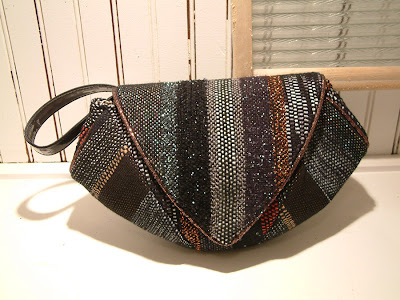 Her bags are all handwoven at her shop in Cyprus, each one is a delight.